Some say October is the most beautiful month, as mother nature really shows off her painting skills and gives us a variety of colors. Well, in October Love Lula’s Beauty Box, there’s a variety of body care and makeup products, along with skincare products – hydrolate and, in my opinion, a star carrier oil. 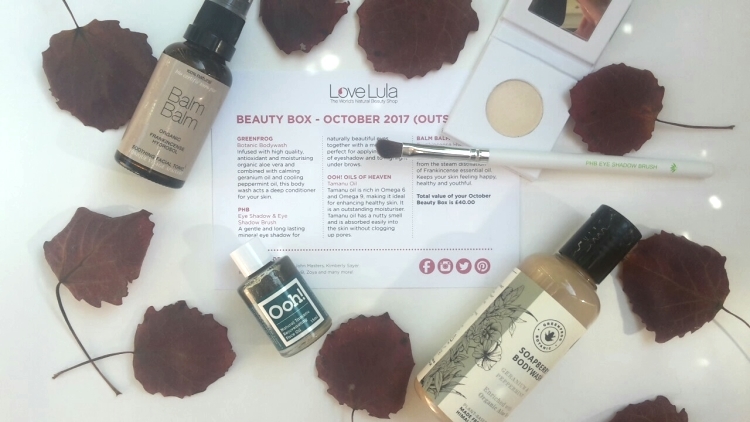 October Beauty Box is worth £40, however, with a subscription to Love Lula’s monthly Beauty Box, you can get it for the price of one product in the box – from £13,95 on. With the Beauty Box comes also a discount code of 20% on all the brands from the current Beauty Box as well. As you know, this is only my first impressions review – a few of the products will receive a detailed review post later on. So, what’s in October’s Love Lula Beauty Box? ♥ Oils of Heaven Tamanu Oil (15ml) – I’ll star with a star carrier oil – the Tamanu oil. I’ve used Tamanu oil from many brands, as it’s been one of my favorite carrier oils for a long time. When I saw Love Lula’s own brand – Oils of Heaven – recently launched their Tamanu oil, I knew it would be included in one of the next beauty boxes – had it not been in this month’s beauty box, I would have to get it, as I suspected it would have been a top notch quality – and it is. This oil will get its own full review – but for now I’ll say this – Tamanu oil is one of the best carrier and facial oils out there – for any type of skin, but especially – if your skin is oily and acne prone – this is a great oil for you. 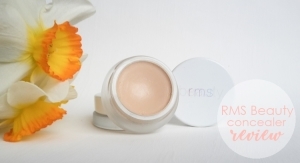 Its absorption is “blink with an eye and you’ll miss it” and it leaves your skin so incredibly soft, almost matte and is a great oil to be used as a primer as well, since it just glides on the skin – actually, primer and serum all in once before applying makeup. One thing I have to point out in case you’re not familiar with Tamanu oil – its color may give you a pause as it’s not a typical golden-hued color, but, for the lack of a better word – looks like a spinach smoothie. Yes, the what seems oily golden part may separate from the green part of the oil, but that does not mean there’s something wrong with the oil – it’s just how Tamanu oil is. Another thing about Tamanu oil that I’ve always liked is its nutty scent, which resembles that of a shea butter, which I am also very fond of. You can be sure Oils of Heaven Tamanu oil will receive a full review soon, but if you can’t wait – go ahead and get it as it’s truly a remarkable oil. Oh, and you can get this Tamanu oil for FREE as well! ♥ Balm Balm Frankincense Hydrolate (30ml) – great hydrolate – and you can never go wrong with a high quality hydrolate – to uplift your spirits and rejuvenate your skin – especially in the morning, before applying a moisturizer – the frankincense hydrolate softens the skin, while also having anti-inflammatory properties. ♥ Greenfrog Body Wash in a Geranium and Peppermint scent (100ml) – not too long ago I reviewed another Greenfrog Body Wash and I like the scent of this one a lot more – of course – since it’s Geranium. Like the other body wash, this one does not dry the skin, but leaves it soft. I wish the scent would have lingered on for a bit longer, but such is the case when the source of scent is natural – essential oils. Have to try the rose and neroli body wash as well. ♥ PHB Ethical Beauty Eyeshadow in Almond – while I’ve been iffy-iffy on PHB Beauty’s skincare, their makeup has been really good (expect a mascara and eye liner review soon). This eye shadow, even though its name is almond, is actually a goldish champagne. It’s quite pigmented, there’s barely any fall-out and it’s finely milled and soft. Great color to be used as a base eye shadow or just in the corner of the eyes, and, if you’re inclined, which I am not – bellow the eye brows. 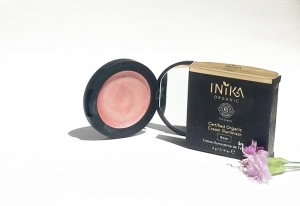 Given this is a natural eye shadow, a pressed mineral eye shadow, you should not expect it to last as long as conventional – it lasts for about 4-5 hours. Now I’m curious about a few other PHB Beauty eye shadows. Will do a full review in the near future. ♥ PHB Ethical Beauty Eye Shadow Brush – not suitable for a precise application, but works OK as a blending brush. May be a bit too sturdy at the root and not rich enough as far as how many bristles there are, but still able to work with it nonetheless. ♥ Glossworks Nails and Cuticles Oils (UK Beauty Box only) – I received this oil back in my August Beauty Box (when those in UK got Glossworks nail polishes, hmph). It contains beneficial ingredients to soften the cuticles, but as I mentioned back in August – a bit too pricey. How did you like October’s Love Lula Beauty Box? Got introduced to any new favorite green beauty products?